Many called us crazy, others called us stupid, some called us crazy and stupid. But for us, hosting a dinner party, albeit one with 100 guests, was just another day at the office. We knew it would be hard work to make the food for our own wedding, but when we thought about doing that which defines our relationship on our wedding day, making a fresh pasta bar and serving it to our guests was simply something we had to do. First off, I have to thank KitchenAide for making such a reliable product. Without Fernando/Fernandina (our unisex name for our KitchenAide), Heather and I would’ve worked pasta dough by hand until we could barely hold a fork and knife. Instead, we managed to churn out four fresh dishes to accommodate veg heads and meat lovers alike. The crowd favorite was the pumpkin and butternut squash ravioli served in a sage brown butter sauce; followed by the vegetable lasagna with herbed ricotta; long slices of zucchini and fresh tomato; then it was a classic — spaghetti and meat sauce made with fresh tomatoes and roasted red peppers; and finally a dish for the more nuanced palate, the truffle mushroom linguini. Fern handled the entire workload like a champ as his/her constant purr eventually became white noise in the bustling kitchen at Honeymoon Acres. But Heather, Fern, and I can’t take all of the credit. With any great event, it comes down to the team who can pick up the slack when they’re called upon. Whether it was Heather’s sister, Mary, and her fiancé, J, rolling out pasta dough and making raviolis with a handy tool our family friend Dr. Amy gave us, or my brothers Matt, Tom, Kevin, and sister-in-law Morgan dusting cutting boards with flour and popping those raviolis into boiling water, everyone played a crucial part. I remember the first thing I saw after I got all dressed up in the back room was coming into the kitchen to see Matt wearing Heather’s apron with flour all over it. It made me so happy. 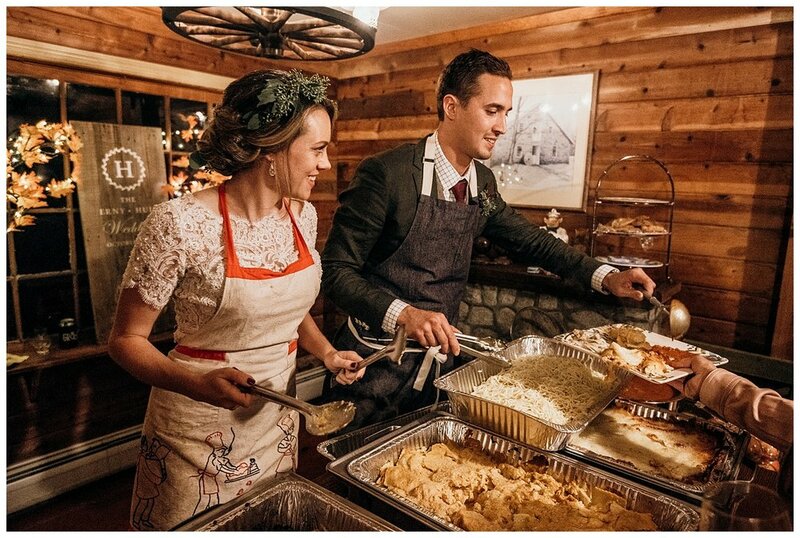 Perhaps my favorite part of the wedding, though, was when Heather and I served the food to our guests before serving ourselves. We originally planned to only serve the first few plates, but we were having so much fun that we didn’t even want to take our seats. When we finally reached the end of the line, we walked through the barn into the dining room to a resounding applause. People were so grateful for the fresh food, but they were even more excited to share that they’d never been to a wedding where the bride and groom were the last people to be served. It didn’t even occur to us that the newlyweds are usually the first to eat because every time we hosted a dinner party at our Colorado home we’d always served our guests first. We didn’t think dinner at our wedding should be any different. When Heather and I first started hosting dinner parties in our home in Colorado, we were amazed by how much fun it was. Perhaps it was me turning 30 and leaving the Jameson shots in Irish pubs for someone else (or some other time :)), but there was something about new and old friends brushing elbows around our table that meant something more to both of us. As we now settle into our interim Long Island home the reason became very apparent when a friend of ours came over for a few fingers of whiskey. It was the simple act of bringing people together, about creating community, about filling a space with jokes and laughter that provided us with happiness. I didn’t know at the time but that’s why I felt the way I felt when I saw Matt in Heather’s flour-dusted apron on our wedding day—it was him being part of our community. There are few days when our communities come together with such a fervent energy to contribute to a cause, but our wedding days are such opportunities. We’ve seen families and friends fall flat and we’ve seen people band together and the result always lies within the glue or gluten that holds us together (Sorry, I couldn’t resist the pasta joke!). Here’s to everyone who played a part, including Dawn and Sandy who volunteered their time to bartend and make the rest of our food look pretty when it came time to serve those most important to us. For those getting married, remember that the miscues of your wedding day will be forgotten in time, but the efforts of your communities will linger in your heart like the flavors of a delicious meal. Don’t be shy, be bold, and do that which defines you. With a little bit of luck and a lot of thought, your communities will have your back. This is one of our favorite foods to cook for guests (usually sub 100 people, but who knows!) because it is SO easy and who doesn’t love pasta? And fresh pasta is just the best! For real, once you have the homemade stuff, you’ll never go back to boxed again. We love it so much that we have an entire recipe – perhaps our favorite one – in The Immeasurable Cookbook dedicated to the stuff. Which, *shameless plug* you should totally go out and buy now if you haven’t already. Older PostGiveaway – Who's Got Cute Grandparents? Thanks for visiting the Apollo Photo Blog!